Last night (Saturday April 9, 2011) was the JDRF Black Tie Gala to raise money to find a cure for Type 1 Diabetes. The of the Gala was “Unfinished Business”, as we will have unfinished business until we find a cure. Here is a picture that I took (it was used as the cover the of program book) of many of our kids who have Type 1 Diabetes with our Gala sponsor Brian Radwell. I was honored to have been asked to provide the evenings Fund-a-Cure speech (see entire text below). As I spoke the photos that are imbedded below were projected on several large screens and monitors throughout the ball room. Immediately after my speech an auctioneer began asking the room to raise their hands if they can donate a certain amount….he started high ($25,000) and worked his way down to $100…in about 15 minutes we raised over $100,000 through generous donations of the 350 people sitting in the room….AMAZING!!! Below is a copy of my speech. If it moves you…if you feel like you want to help…please feel free to contribute by making a donation to the JDRF Ride for the Cure ( http://www2.jdrf.org/goto/teamkasper) that Rachel and I are doing in September. Our personal goal is to raise $10,000 and I think we can make it with a little help. Thanks so much!! Good evening. First and foremost, as a dad of two kids with Type 1 Diabetes and a member of the JDRF South Jersey Chapter Board of Directors, I want to thank you all for coming out tonight to help us in our mission to fund the cure for type 1 diabetes. As I look out across the room, I see several hundred of my friends and family all gathered to accomplish the same mission. I use the word family because, as I am sure all of you know, we all can relate to one another and the challenges we face on a daily basis in a way that non D families cannot imagine. I have always believed that there is a silver lining in every dark cloud, and a reason behind everything that occurs. To that end, I am thrilled to have gotten to know each and every one of the members of this extended family, and have grown relationships with many of the people in this room that I know will last a life-time…that’s the silver lining. On the other hand, I have to be perfectly honest…I am dreadfully sorry that we ever had to meet! 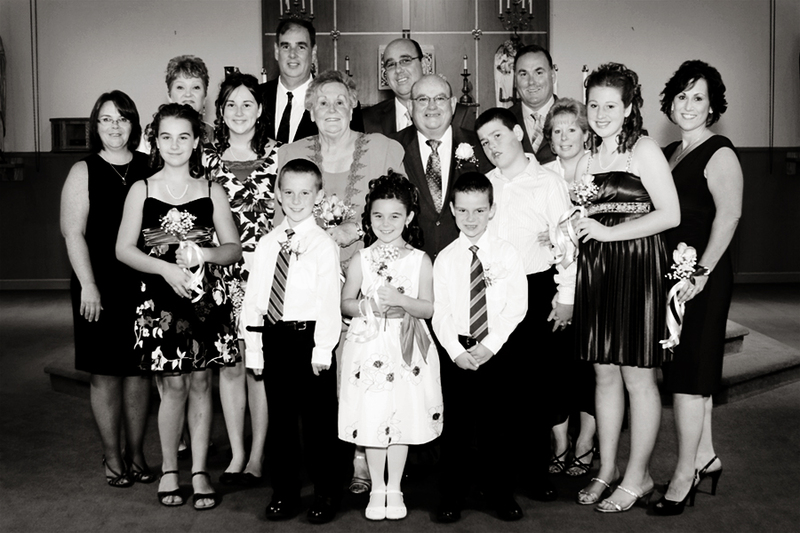 We have all heard the saying that you can choose your friends, but you cannot choose your family. I guess none of us had the choice to join this family. My mission is to prove that saying wrong by working tirelessly to fund the research needed to find a cure for type 1 diabetes so that we can all divorce ourselves from the clan. While I love you all, I just don’t want to be a part of this family any more! I want out…but I do want to be invited to the reunion. I want our outstanding Gala Chairs, the Petcoves and the Mogells, to begin planning a reunion gala so that this family can get together and reminisce about the trials and tribulations of what we used to go through before our kids, mothers, sisters, brothers and all 3 million Americans were cured! I want you to think about how you can help get us there through your generosity and support tonight. I want you to think about how truly important it is to all of us to find the cure! Since family is my theme this evening, I want to give you a snapshot of the Kasper family…we don’t have a white picket fence or a cat or a dog, but aside from that we are the typical family living the American dream. When our nuclear family gathers we spend time comparing notes about work, we debate politics, and we talk sports. We also compare pump settings, count carbs, brag about our new glucometers, and wake up at 2 o’clock in the morning to check blood sugars. You see when my family gets together we have a group of type 1 diabetics that include 2 young boys, their grandmother, their aunt and their cousin…it really is a family affair. But what is the impact? How has this shaped our lives? Why is so important to find a cure? The bottom line is that life with type 1 diabetes, especially for these kids, just plainly stinks. It’s not easy…there’s one challenge after another. For example, whether it’s making a seven year old diabetic or a thirty-seven year old non-diabetic school room mom understand the importance of diet, it’s clearly a challenge. My seven year old will say something as innocent as, “but I only ate a small candy bar” when his blood sugar is 400, or the room mom at school who will say something like “he can eat anything at the party as long as I don’t put sugar on it”, life is a battle of managing normalcy with good diabetes health. Until we find a cure that battle will cause me to wake up every night, as I have for the past 7 years, to check my sons’ blood sugars, or to simply look in and make sure that they are still breathing and not in a hypoglycemic coma. What about from the kids’ perspective? We are, after all, a family and their input matters? How do we know how they feel about it? One day, I set out to determine just that. First I approached Jake, who was 5 at the time, and asked him to tell me one word that described what it was like for him to live with diabetes. He quickly and simply said, “Brave!” Having been diagnosed at the age of 13 months, he has essentially known no other way of life, but has been on the receiving end of needles and syringes ever since. He knows he has diabetes. He knows he needs to check his blood sugar. He knows he needs insulin. 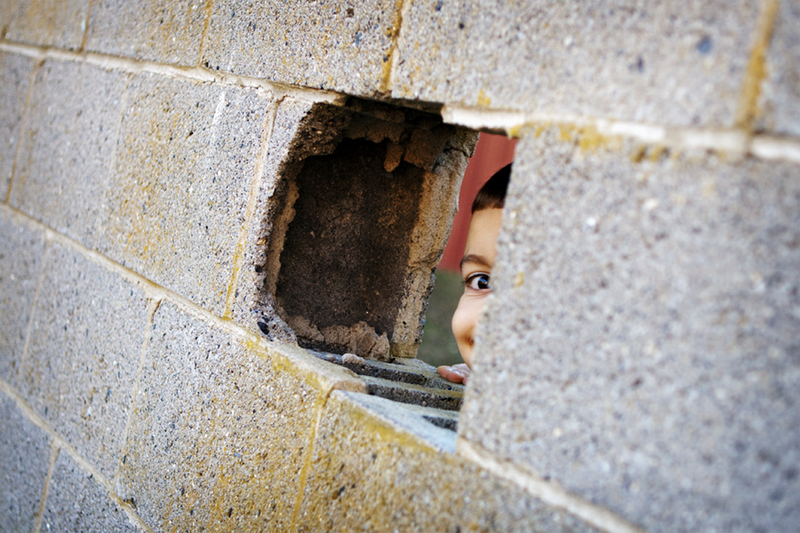 But at the time he was only 5 and doesn’t truly understand what all that means…he only knows he needs to be brave! When I got done with Jake, Matt was my next target. He and Ryan (who is my middle son and does not have diabetes) were at the kitchen table. Matt is shy and reserved about expressing his feelings…typical pre-teen!! He was hesitant to engage in this exercise, but I kept pushing. In the mean-time, Ryan interrupted and was told to wait just a minute until I was done with Matt. The discussion ensued…Ryan interrupted several more times, and each time was told to wait with an increasing tone of sternness. Finally Matt said to me “it’s difficult.” I told him I knew it was difficult, but if he could just try to think of a word I would leave him alone. “no Dad, that’s my word. My life is difficult”…from the mouth of a 10 year old kid! So I was done focusing on Matt and Jake. I got what I needed. My goal had been reached. I was able to describe in one word and with a photograph, how diabetes had touched the lives of two of my sons. It seems that they are always the focus. At meal time its blood sugar checks and boluses. Family activities are interrupted because of emergency site changes. Plans are altered or cancelled because of ketones and sick day rules…all because of diabetes, and in Ryan’s young mind all because of his brothers….Oh, wait, I almost forgot. What about Ryan? He had wanted to say something while I was focused on Jake and Matt. Finally I gave him his turn. “I wanted to tell you my word,” he said. This is very important to me, and I hope it is to you as well. The fact is that there are 3 million Americans living with type 1 diabetes. If the experience of my family is any indication of the impact of that, it means that there are 7.5 million people living in families with diabetes who are impacted as well. I would never presume to compare the impact of those who live with the diagnosis to that of those who live with the diagnosed, but the reality is that this disease has had a profound effect on all of us, and we all need to find a cure. We need to find a way that when Ryan asks, as he gets ready to go to bed, when it will happen to him that I can say it won’t…we found a cure, we discovered how to prevent, we were successful and we can protect you! As I am sure you expect, I will end this speech with a plea to open your wallets and pocket books and contribute as much as you can to help fund the cure. Before I do that, however, I want to tell you one more story that illustrates the fact that this disease impacts every aspect of family life. The kids decided that they wanted to play Sorry. I thought okay, that’s fun enough, and doesn’t last all afternoon the way monopoly does. Rachel was reading a book (if you can still call it a book when all one does is scroll from page to page on the Kindle), I was available, and it’s a game for four players….perfect!! Well, not exactly. One of the things my kids like to do most is NOT put stuff away when they are done playing. As it relates to this story, that means that there are no green Sorry pieces left. “That’s okay Dad”, Jake said. “I know what we can use!” Off he went toward what we refer to in our home as “The Cabinet,” where we have a veritable pharmacy of diabetes supplies. Within moments he returned with four cone shaped objects, just the right size to substitute as a Sorry game piece. It did not strike me at first, but as I got my first turn I quickly realized that the pieces he had provided were, in fact, packaged needles for the insulin injector pen. Diabetes has, in large part, impacted every aspect of our lives. About this, Rachel and I are very sorry! We’re sorry that two of our boys have to grow up with the daily complexities of life with diabetes. We’re sorry that my middle son wonders whether he will ever become diabetic, feeling invisible while he wonders. We’re sorry that, perhaps, something we did or something we genetically passed on has caused this to happen…on a daily basis we are sorry! That day, without even missing a beat and without realizing how NOT normal this is, my six year old resorted to using insulin injection supplies to play a board game … not just any board game … a game of Sorry! Please donate. Please give generously. Please help us raise the funds needed to enable the researchers around the world find a cure so that next year you’ll be invited to that reunion rather than another fund-a-cure Gala and that we’re all not sorry that we didn’t give more sooner!! Yesterday was an awesome fall day…from a photographer’s perspective there could have been a few more clouds in the sky to help soften the light, but it was indeed gorgeous weather. It was the perfect day for me to meet with this wonderful family for the second year in a row. We had been talking about shooting in Philly somewhere but that didn’t work out. As it turns out, the kids really wanted to head back to the same place we did this last year, so we met at the Smithville Mansion at Smithville State Park in Burlington County….it’s a very cool place for photos! We had some funny moments during our session. Apparently the humidity was very low and there was a significant amount of static electricity in the air. Now, those of you who know me know that with even the smallest amount of static, my hair is totally unmanageable and stands straight on end….apparently this little girl had the exact same problem!! It was great working with these kids again….Its amazing how fast kids grow up in just one year!! I’m already looking forward to next year! Inspiration Through Art (formerly known as The Little Heroes Project) is a non-profit organization that has gathered a network of photographers from around the country and connects them with families who have a child diagnosed with a significant, life-altering medical condition. The photographers work with the families to provide a free portrait session for the child and the family. I am privileged to be one of those photographers, and want to share one of my recent experiences. Back in the spring, I was assigned to work with a family here in South Jersey who has a son, Kyle, who suffers from epilepsy resulting from a traumatic brain injury, and experiences frequent seizures. When I initially contacted his mother, Rose, to start the process we discussed one of the most important aspects of any photo shoot – location. Where were we going to do this shoot? Let’s get back to that later. Rose explained to me many of the challenges that Kyle faces each day. She explained his seizures and his multiple hospitalizations. She explained the brain surgery that Kyle could potentially have that would help to stop these seizures, and without actually saying the words, throughout the conversation she explained what an amazingly supportive and brave family she has. Among the details that she provided me during our talk was that Kyle’s one true love (besides him mom, of course) is baseball. Now, back to the location discussion…Hearing this, and having heard the entire story of Kyle, I immediately thought we needed to get him in his element…let’s do the shoot at the baseball field. 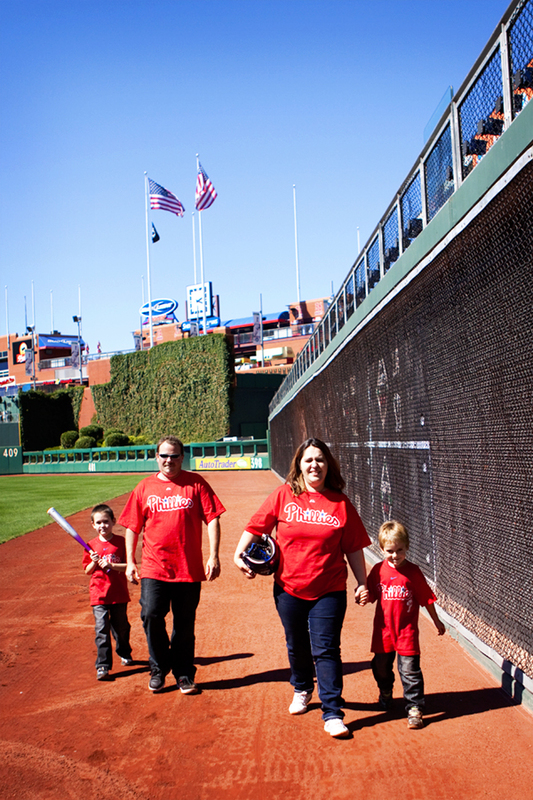 Rose thought this was a great idea, so I immediately did whatever anyone in my position would do – I contacted the Philadelphia Phillies and requested permission to take Kyle and his family to Citizen’s Bank Park so that I could do the photo shoot on the baseball field. That seems logical, doesn’t it? 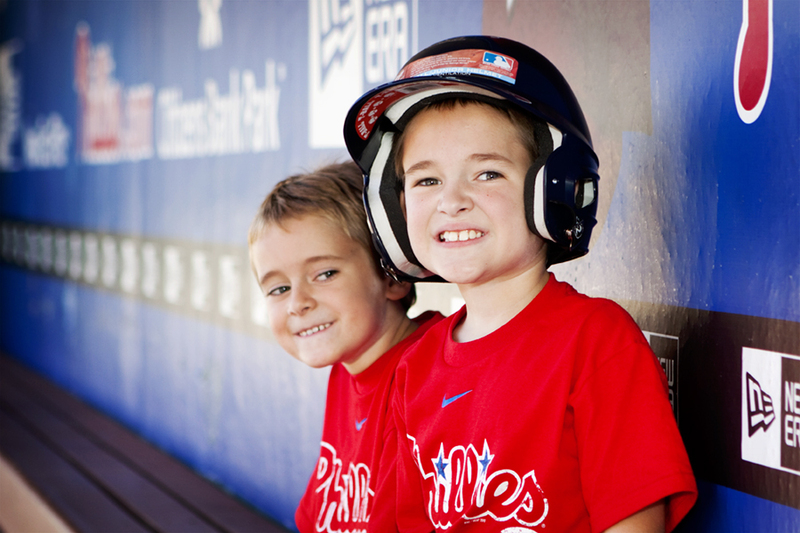 When I first reached out to the Phillies, it was not easy. I do not know the owners, the senior management, the coaching staff or the players. So whom should I contact to help me get my foot in the door for such an unusual request about which “no” was not among the acceptable answers. With the help of a friend who works for Comcast, a company that provides Cable TV and internet services to much of the Northeast and who owns several of the local professional sports franchises here in Philadelphia, I was able to make first contact. I ultimately spoke with two incredibly helpful woman from the Phillies’ Community Outreach department, and after several phone and email conversations, I finally got the approval I needed. To be honest, although I wanted to provide Kyle with an experience he would never forget, I had not been hopeful that the idea would work. I was incredibly psyched when the Phillies gave me the ability to make that happen!! As an organization they are clearly supportive of giving back to their fan base, and on behalf of Kyle’s family, I thank them for their willingness to work with us! The next challenge was the timing. 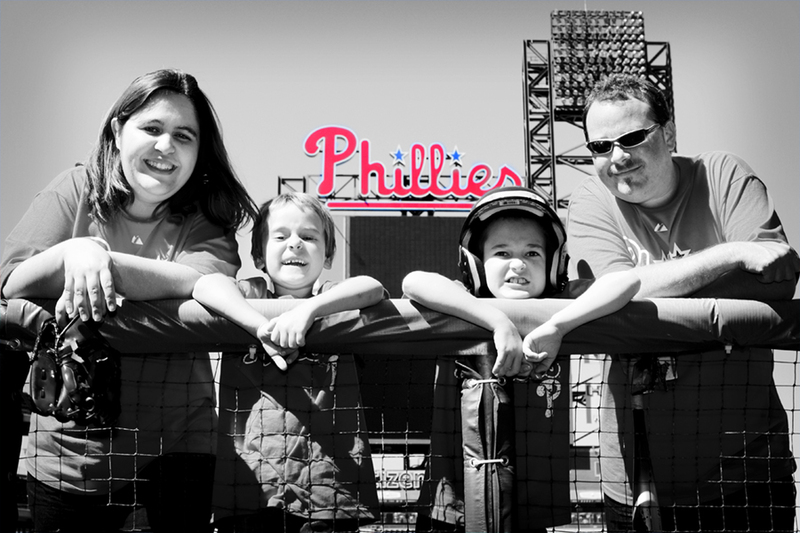 We had to pick a day that I was available, the family was available, the Phillies were out of town, and the weather was good…no problem! Let me tell you a few things about Kyle. He’s a fighter! In fact, that is the one word that his parents used to describe him and how he fights his disease every day. Rose warned my that I shouldn’t be disappointed if Kyle doesn’t seem to be excited when we get to the stadium. She explained that he often does not show his emotion in that way. I can assure you that everyone at Citizen’s Bank Park clearly saw just how excited he was for every minute that we were there! Question: What makes you a hero? Answer: After everything I go through I still have a smile and a hug. I’m a true fighter. After our photo shoot was done I became one extremely fortunate photographer. I got one of those hugs from the valiant little fighter (and one from his little brother!!) who is very clearly one of my heroes! Here are just a few of the shots from Kyle’s phabulous Phillies photo shoot. Bob and Joan were married! 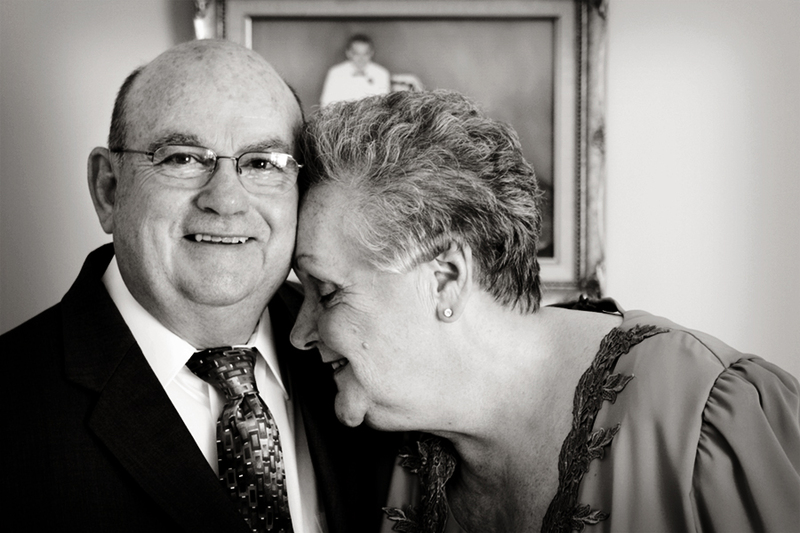 Bob and Joan celebrated 50 years of wedded happiness!! 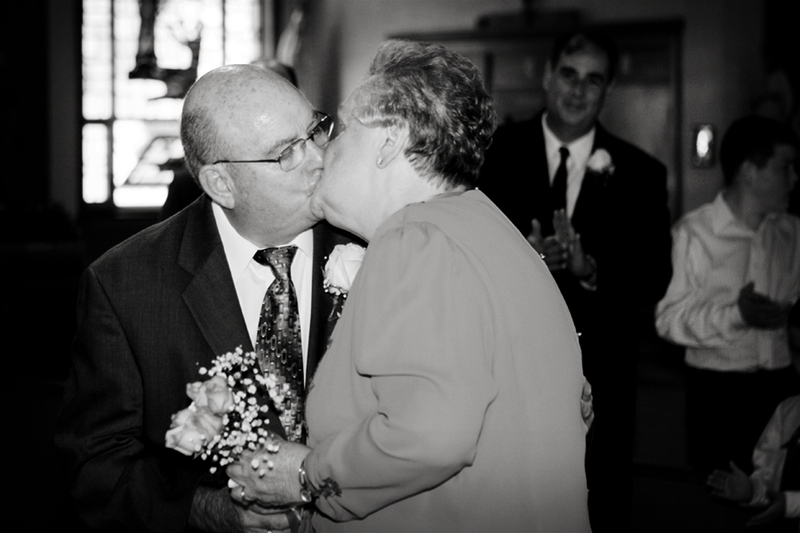 On Saturday September 11, 2010 Joan and Bob gathered their family to celebrate their wedding anniversary. 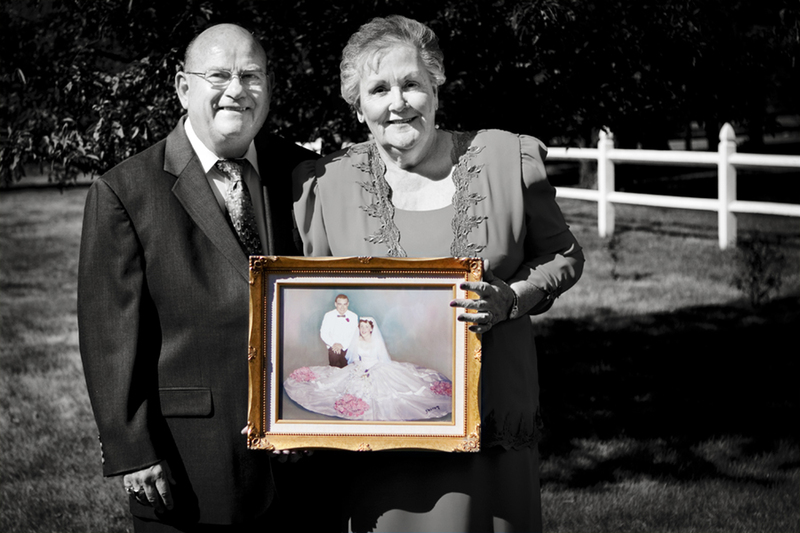 They brought together three sons, a daughter, two daughters-in-law, and seven beautiful grandchildren to celebrate a legacy that they started in 1960 – fifty years ago! 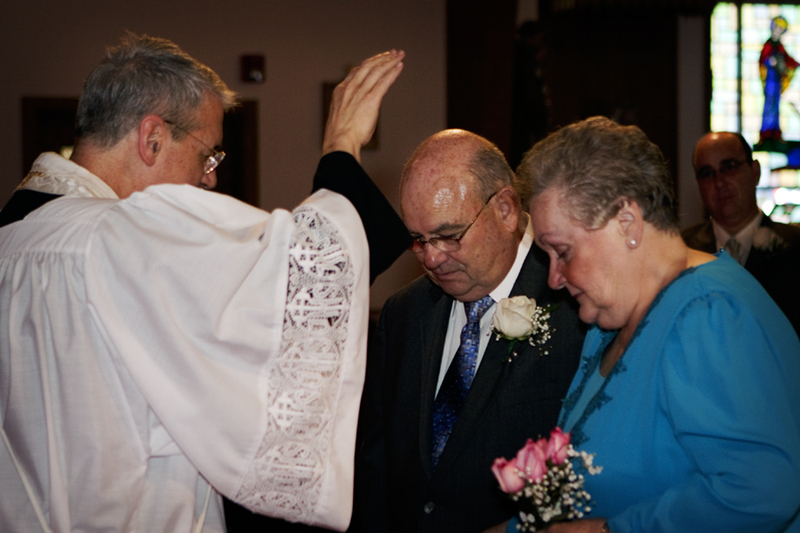 In a small, intimate service, Bob and Joan renewed their vows to love, honor, and cherish…. Congratulations to Joan and Bob, as well as the rest of this beautiful clan, for having lived through “better and worse” for the past 50 years, and for having provided what seems to me to be a strong foundation for your future generations! I wish you many more wonderful years of health and happiness, and I thank you for allowing me to be a small part in your celebration!